Enter Tony Medawar, crime fiction scholar, who has gathered together an impressive collection of long-lost stories, some of which have never been reprinted since first being published – and in one case, is being published for the first time. But just because things have been rediscovered, does that mean that they’re worth reading? I’m not going to give a story by story breakdown – I’ve leave you to pop over to Kate’s excellent review at Cross Examining Crime for that – but to take a look at the book at the whole. To be honest, I’m not a massive fan of crime fiction compilations – I have a little trouble switching from style to style of the various writers for some reason, but for some reason it didn’t bother me here, despite not only switching from writer to writer (and in two cases to script form). In part, this might be due to the academic interest of such lost texts, but the quality of these lost tales helps a lot too. Yes, there are one or two iffy tales – the Crofts tale starts well, but slams to a very sudden halt, and despite its quality, I’d have preferred to have seen an alternative John Rhode title to The Elusive Bullet, which I have in two (admittedly out of print) compilations already. The highlight of the book has to be the previously unpublished Christianna Brand tale, The Rum Punch, a short story almost worth the price of the book alone, but there are many more to enjoy here – there’s a beautiful tale from Cyril Hare, an unpublished Agatha Christie story, a highly enjoyable novella from Anthony Berkeley… I could go on. 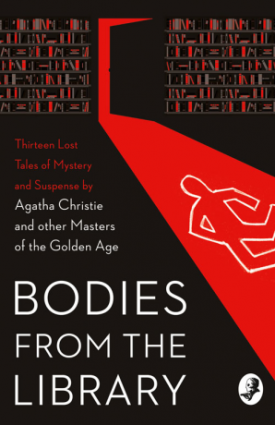 This is an essential read, not just for the academic interest of lost works but also for simply being a highly enjoyable collection of Golden Age tales of mystery. I gather there’s going to be another volume next year – I wonder, are there any long lost Brian Flynn stories out there? It’s not as if anyone would have been looking for them – but in the meantime, do yourself a favour and pick this one up. It’s Highly Recommended. Many thanks to Harper Collins for the review copy. Excellent. Nice to see a traditional GAD publisher getting back into the swing. (They were a high end jigsaw puzzle company that published quality editions of huge amounts of GAD, most of Carr for example).